Chief John McKeown has served with the Monroe Township Police Department since 1991. On June 1, 2013 he was appointed as Chief of Police. He has served as Patrol Officer, Corporal, Sergeant, Lieutenant and Captain. He served in the Community Policing Unit, as an instructor in use of force, weapons and tactics and as the department Training Coordinator. Chief McKeown served on Monroe Township’s Entry Team for 8 years as team leader and trainer. Chief McKeown served 17 years with Gloucester County Special Weapons and Tactics Team as a tactical team member, team leader and commander. He is currently serving on the Gloucester County Chiefs of Police SWAT Committee. 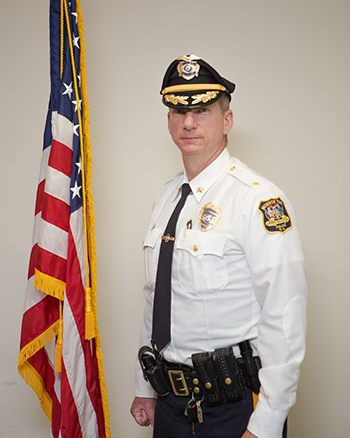 Chief McKeown has a Bachelor of Arts Degree in Law / Justice from Glassboro State College and a Masters of Administrative Science Degree from Fairleigh Dickenson University. He is a Certified Chief Law Enforcement Executive by the New Jersey State Association of Chiefs of Police, a graduate of their Police Executive Institute and the FBI Mid-Atlantic Law Enforcement Executive Development School. He is an adjunct professor at Rowan College at Gloucester County. As always, if you ever have any crime information, feel free to email crimetips@monroetownshipnj.org!